RingByName provides users with an expansive service specifically designed for small to mid-sized businesses.The provider utilizes a number of different services to create an inclusive and supportive cloud service. 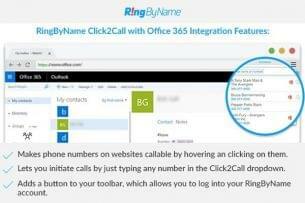 RingByName’s service plans vary by price and intended amount of users. The range of users includes 2-4, 5-19, 20-49, and 50+. Each of these plans comes with unlimited calling, free desk phone for each user, and free integrated CRM (customer relationship management). Additionally, RingByName also includes a host standard services including: Virtual Receptionist, Mobile App, Free and Built-In CRM, Integration with popular software and systems, Comprehensive Call Management, Call Screening, Sophisticated Voicemail, Missed Call Alerts, Call Forwarding, Virtual Extensions, Message Alerts, Answering Rules, Connectivity using any device (IP phones, Mobile App, Soft Phones, Faxing), Quick Click Calling, Call Recording, Advanced Call Routing, Detailed Call Logs, and World-Wide Calling, Smart Receptionist, Music on Hold, Personalized Caller Greetings, and Customizable Greetings. As stated above, each service plan features unlimited calling to Canada and the US. In addition to this, RingByName also offers International Calling. International Calling Rates are determined by the country trying to be reached. Along with rates and feature, RingByName allows users to sync their contacts to create a comprehensive list, allowing integration of both Google Contacts and Microsoft Outlook contacts to be easily imported. Also, RingByName can also integrate with softwares and applications including social networks, Salesforce, Batchbook, Quickbooks, and ZoHo. -Via Customer Support Center, which is accessed through logging into web portal. The user has access to resources to submit assistance tickets, report problems, and more. Price: Each plan is divided by the amount of users, which is what ultimately determines the monthly pricing. Add-on Features: are subject to additional individual monthly pricing. – R! Fax: two options—1. R! Fax Lite: $7.95 per month, includes unlimited inbound faxes, up to 250 pages outgoing, and additional outgoing pages at 2.5¢ per page. 2. R! Fax: $14.95 per month, includes unlimited inbound faxes, up to 500 pages outgoing, and additional outgoing pages at 2.5¢ per page. – R! Virtual: includes free phone numbers (free local numbers, toll-free numbers for small extra fee), customizable greeting, advanced call routing, mobile apps, unlimited extensions and voicemail, and 1000 minutes anywhere in US or Canada for one monthly price. Users must contact provider directly for specific pricing. What Do You Think of RingByName?